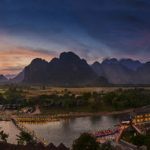 Vang Vieng is the perfect holiday destination for nature lovers and adventurous travellers; there are numerous activities to enjoy and more of the unknown to discover through the four natural elements that make up this picturesque town. Offering a new perspective to this rural escape, the newly opened Amari Vang Vieng encourages visitors to experience more through their senses whether they are out exploring or taking a restful break from the excitement in the area’s first international hotel. 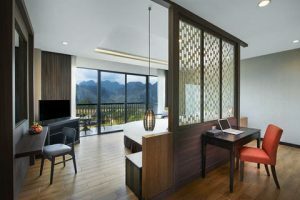 Each and every comfortable room offers a choice of calming city views or stunning mountainous and river landscapes, completely highlighting the rooms’ modern designs in earthy tones and cool hues inspired by the four elements of Vang Vieng; Water, Earth, Wood and Energy. Water is key to life, as the Nam Song River flows through the heart of Vang Vieng, like adrenaline running through the city’s veins. Athletic travellers who are looking for a thrilling workout out should rent a kayak or canoe. Paddle through town and the gorgeous natural scenery or take on the challenging rapids ⎼ either way, it will be an experience to remember. It is impossible to miss the iconic limestone karst mountains surrounding Vang Vieng, which represent the element of Earth, strong and grounded. Hike up Phangern Mountain to appreciate the lush greenery that spans for miles from the viewpoint. Rougher climbs are also available for the fearless explorer ⎼ rock climbing up the towering karst mountains, with routes for both novices and veterans. But the earthly elements of Vang Vieng do not only reach new heights; they also take the form of mysterious caves. A cluster of four distinctive caves in the northern parts offers an array of activities, from swimming in the underground water cave of Tham Nam to discovering the elephant-shaped rock formations in Tham Xang. Explore more of the caverns through lit stairwells and echoey chambers in Tham Hoi and Tham Loup with your fellow adventurers on a mysterious expedition you will remember for years. Contrasting the hard and resistant stone and Earth, visitors can find more autonomy in the soft forests of Vang Vieng, reflecting the element of Wood. Rent a bicycle for a ride on the dirt roads, through countless trees, rice paddies and mountain ranges. Professional riders can brave the unadulterated mountain trails if the simpler paths do not offer enough of a challenge. There are also zip-lining adventures available, taking visitors on a flight through the canopies of forest jungles, whizzing through the trees with amazing views from above. Beyond the physical elements that make up Vang Vieng, there is a unique sense of tranquillity found in the community, embedded deeply in the town’s atmosphere. The element of Energy cannot be easily replicated and that is what gives Vang Vieng its calm yet animated personality. After all the excitement and activities during the holiday, wrap up the adventure with a relaxing hot air balloon ride over quiet rural landscape at sunrise. The breath-taking view is sure to be an unexpected, albeit very pleasant, surprise. Get into your element with Amari Vang Vieng with rates starting at 60 USD ++ per night. 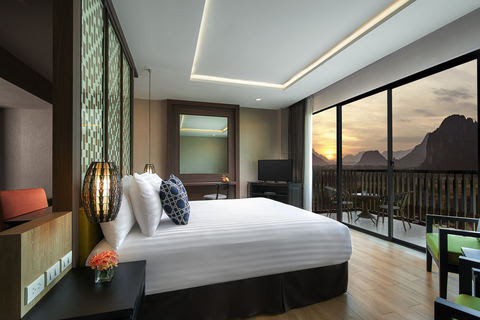 Reservations made on www.amari.com will receive a complimentary upgrade to a Superior River View Room overlooking the scenic Nam Song River until 27 December 2018.